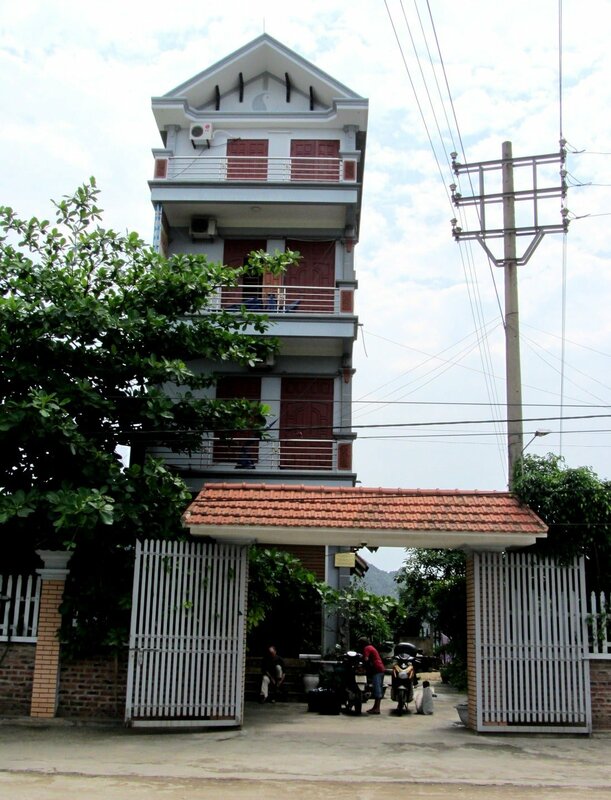 Nho Quan is a small, industrial town in Ninh Bình Province, 90km south of Hanoi. The bare concrete buildings, dusty streets and cement trucks roaring to and from nearby quarries are a far cry from the natural beauty of the surrounding area, which draws thousands of domestic and foreign visitors to this province each year. 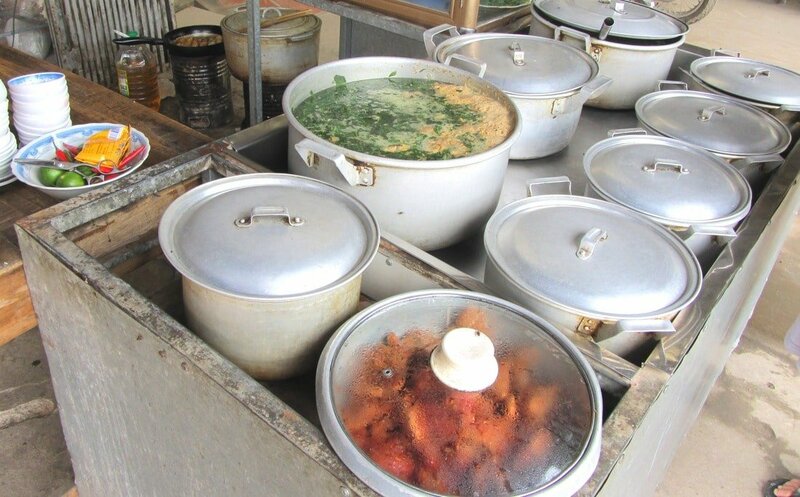 However, there is one reason why you’d consider making a detour to this town: hidden amongst the unappealing sprawl of Nho Quan is one of the best soups in Vietnam. The soup is called bún riêu, and the place that serves it is Ms Thập’s soup house [MAP]. Bún riêu is one of those Vietnamese soups that’s so packed full of ingredients it seems as though the produce of an entire market has been thrown into one bowl. Bursting with ingredients, colour and flavour, bún riêu is a national favourite. But even by the standards of a soup that has everything in it, the one at Ms Thập’s soup house is jammed with goodies; so much so that even the name – when written in full – is a mouthful: bún riêu cua chả lá lốt trứng vịt lộn. The broth is poured over thin white rice noodles, called bún. Then the fun really starts as Ms Thập adds all the extra bits and pieces into the bowl: quartered tomatoes, strips of silken tofu, chopped spring onions, roasted shallots, little patties of crab meat, a couple of raw chicken eggs that cook slowly in the broth, chopped pieces of chả lá lốt which is minced beef or pork rolled in an aromatic betel leaf, and to top it all off a whole foetal duck egg. The latter is popular all over Southeast Asia, but some people may find it hard to stomach – just ask to have your soup without it: không trứng vịt lộn. When the bowl is finally handed over to you, there are still more ingredients and flavours that you can add to your soup: banana blossom and bean sprouts for crunch, chilli for heat, garlic for extra tang, and two herbs that add a whole new dimension to this soup; fresh mint and perilla leaf. Stir it all together and let it settle for a minute. There is so much nutrition in this bowl of soup that it could easily keep you going until dinner time. The amazing thing is that, even with all those different components in it, they all somehow coalesce. During each mouthful your taste buds experience a kind of carousel of flavours, but without any particular one dominating. And, like all soups, because the broth is still hot the taste is constantly changing as you make your way through the bowl – flavours waxing and waning according to how they react to changing heat levels. A bowl of soup at Ms Thập’s is more than just breakfast; it’s an experience. 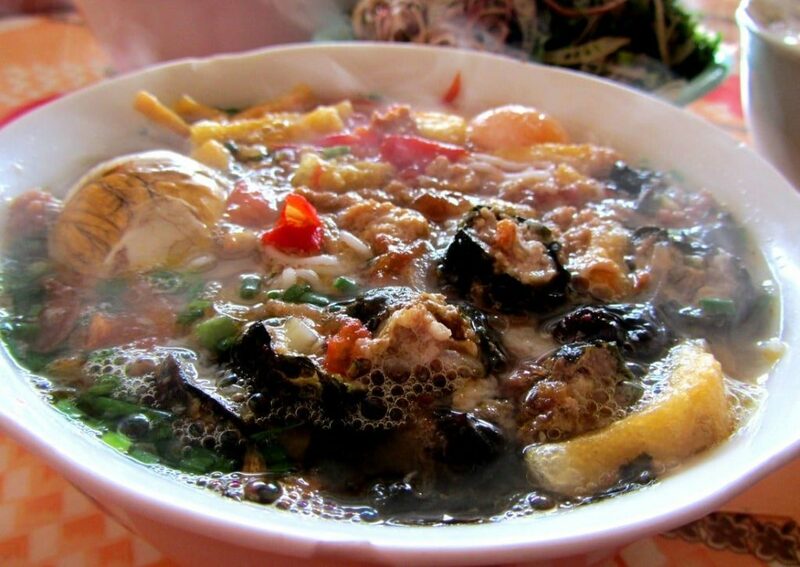 How much does one of the best soups in Vietnam cost? 20-30,000vnd ($1-$1.50) a bowl. VIDEO: Bún Riêu at Ms Thập’s soup house in Nho Quan town, Ninh Binh Province. Apart from the fantastic flavours and sheer quantity of ingredients in this bowl of soup, another contributing factor that makes Ms Thập’s bún riêu one of the best soups in Vietnam is its unlikely location. Nho Quan is a hole of a town. Even though it’s just a short drive away from some of Vietnam’s most popular attractions and prettiest landscapes, not many tourists venture into the concrete and dust of Nho Quan town. If you look in the right direction it’s still just about possible to imagine how this town might have looked before Vietnam began industrializing: a small settlement of wooden and stone dwellings built on a river, surrounded by rice paddies, and hemmed in by towering limestone pinnacles. 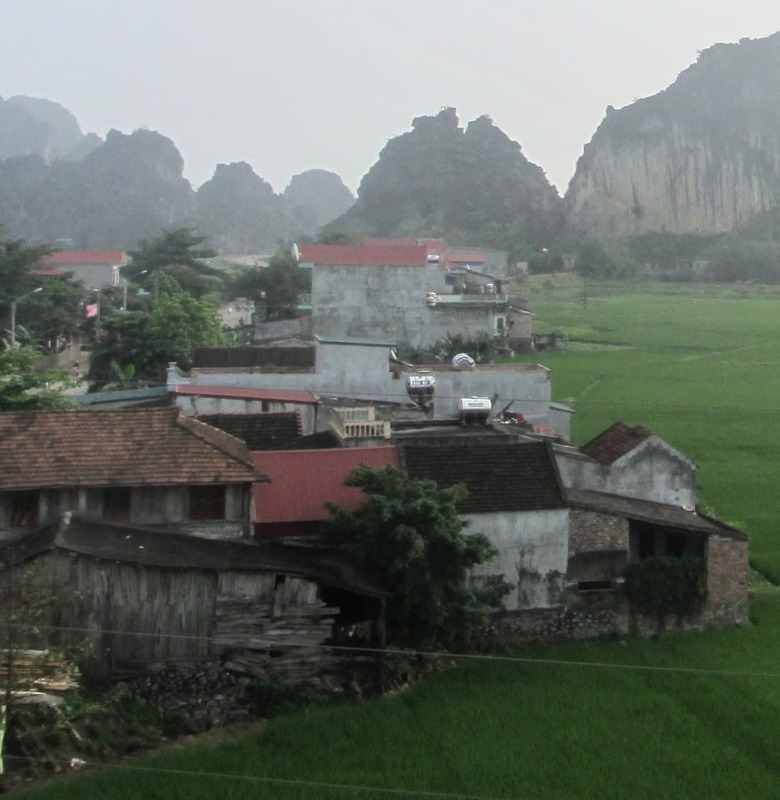 Unfortunately, it is the exploitation of the latter that has changed the town and threatens the natural beauty of this entire area: the limestone hills are constantly being quarried for building materials which, in a rapidly developing country like Vietnam, are in high demand. Quarries ring the town, and big, overfilled trucks roar along the high street, the drivers impatiently leaning on their horns. The noise and dust that they produce is unbearable and the river is black with filth. Nho Quan has profited from this industry, but the town’s new concrete buildings are mostly left bare, unpainted and grey. But, one of the joys of visiting or living in Vietnam is discovering great food in places where you’d least expect to find it. That’s exactly what Ms Thập’s soup house is. On a dusty, grey road only a hundred metres or so off the dusty, grey high street, this soup house is a classic Vietnamese food shack: grey concrete floor, fluorescent strip lights, a couple of rotating electric fans, small tables and chairs, and a TV set on a random channel. If it weren’t for the steaming pots and pans out front on the sidewalk sending the aroma of betel leaf into the air, it would be easy to pass by without noticing. 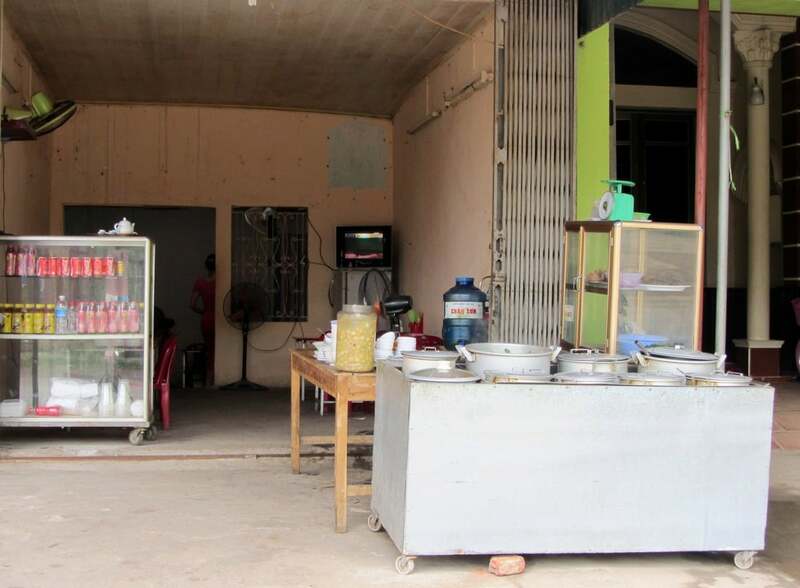 1: The soup house is located on Road 12B just before the T-junction with Road 477 (Nho Quan’s main street). 2: The soup house is next door to a tall, four-storey yellow building. 3: The soup house has an old, faded awning for a hair salon with a couple of cheesy images of hair models – presumably this was a previous incarnation of the store and has yet to be taken down. 4: In the mornings there’s a yellow sign outside with the words BÚN RIÊU CUA in big red letters. 5: From about 10:30am onwards there’s a white sign outside with the word CƠM (rice) in big red letters. Bún riêu is only available in the mornings. The earlier you get here the better. From about 11am the soup house changes into a lunchtime rice eatery. This transition is marked by the shift in responsibility from Ms Thập to her daughter. I didn’t stay for lunch, but by the look of the food displayed in the dozens of pans, I’d say that even if you get here too late for a breakfast soup you’re still in for a treat with a rice lunch. Arrived too late for soup? Try Ms Thập’s rice lunch instead! Nho Quan has a small bus station with regular local buses to Ninh Bình and Hanoi. 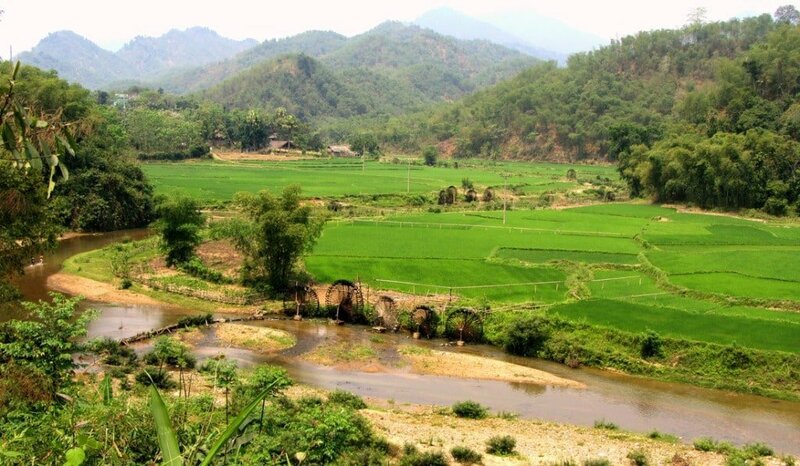 Nho Quan is located between two popular tourist areas: Cúc Phương National Park to the West, and the various cultural and natural attractions of Ninh Bình to the East. It’s just a short bus, motorbike or bicycle ride from most of these places to Nho Quan – but beware of the trucks from the quarries on all roads in this area. 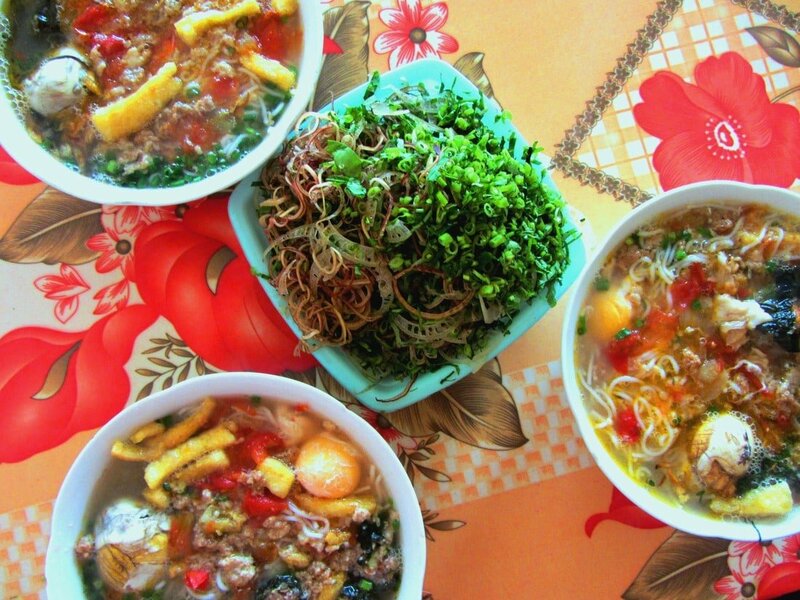 A visit to Ms Thập’s soup house is all that Nho Quan has to offer, so a day trip should suffice. However, if you want to make it to the soup house nice and early there’s a good guesthouse in the area. Nhà Nghỉ Nhật Nam (Tel: 0303 867 034 Mob: 9084 921 476 Address: Lạc Vân, Nho Quan, Ninh Bình) is on your right if you’re heading out of town due north on Road 477, a few hundred metres after crossing the bridge [MAP]. Look out for the sign. It’s a three-storey grey building with good, clean and spacious rooms. Get a room at the back for views over rice fields and limestone hills: 200,000VNĐ ($10) a night for two people. Another option is the Cúc Phương Hotel which is in town just after crossing the bridge. This hotel is closer to the soup house but not as nice as Nhật Nam Guesthouse. 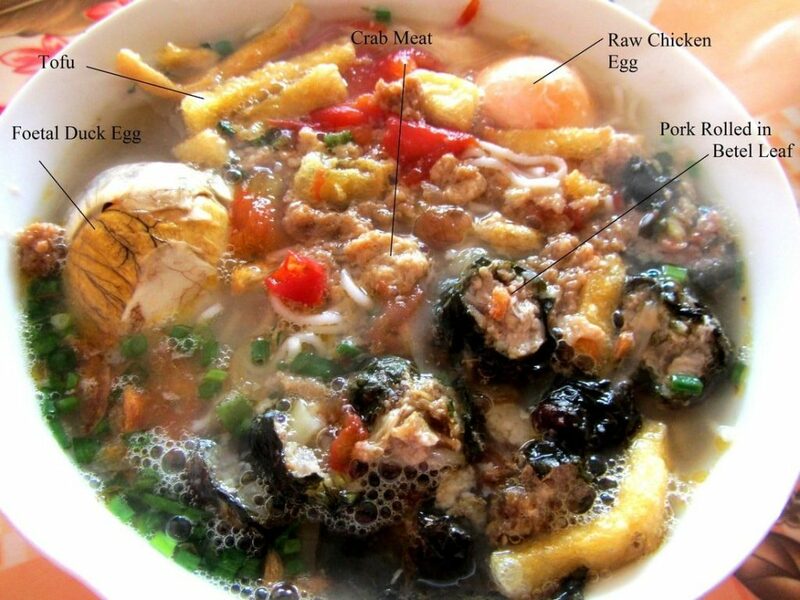 This entry was posted in ALL, FOOD & DRINK, Noodles, Soups, Street Food, The North and tagged bun rieu, food, guide, Ninh Binh, noodles, soup, street food, Vietnam. Bookmark the permalink. So, is Ms Trap House closed ? I haven’t had a chance to go back recently, so I don’t know for sure. aargh…i went today to order myself a bowl, but i looked and looked and nothing. i think ms. thap’s house is closed and is now a hair salon. i can send a pic if you tell me where to send. Yesss, I know that place. It’s just a few steps from my home lol. I usually eat bún mắm at home, my mom’s cooking :D. I know some other places but they’re not that good. Yes, I like bún mắm. If you look at my Food & Drink category you’ll see a post all about it – I particularly like Bún Măm 444 on Lê Quang Định street, it was right next to my old house 🙂 Do you know any other good places?? 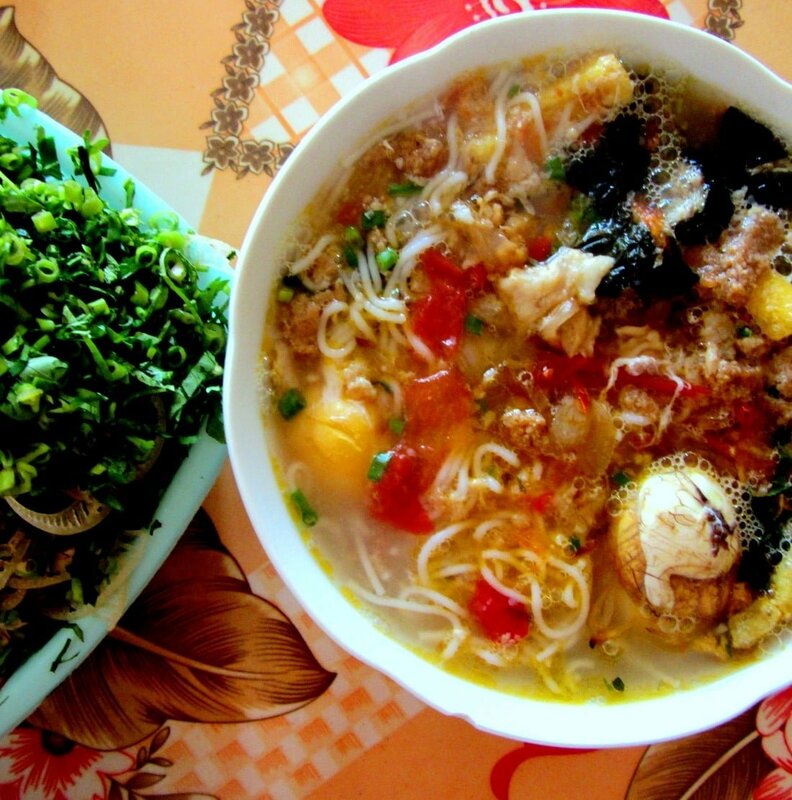 Bún riêu is one of the most common noodle soups in Vietnam. In the South, we have Bún Riêu Cua Chả while in the North Bún Riêu Cua Ốc is more popular. This is the first time I heard about Bún Riêu Cua Chả Lá Lốt Trứng Vịt Lộn. Its long name already told you what the main ingredients are. There is not much difference in flavour between Bún Riêu Cua Chả and Bún Riêu Cua Ốc because they both use indispensable ingredients for the soup (crap meat, tomatoes and tofu). These ingredients are also included in Bún Riêu Cua Chả Lá Lốt Trứng Vịt Lộn, but I am curious about its flavour with the presence of Trứng Vịt Lộn, so I definitely want to try it at Ms. Thập’s place if I have chance to visit Nho Quan, Ninh Binh. Thanks a lot for your sharing, Tom.